Young French driver Nicolas Ciamin turned in an excellent drive on the Rallye Mont Blanc-Morzine, which counts towards the French Rally Championship, last weekend. 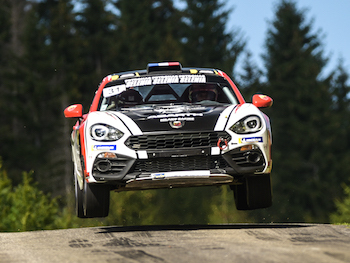 The Abarth 124 Rally enjoyed three more class successes last weekend thanks to Frenchmen Nicolas Ciamin and Antony Vilanova in the Rallye Mont Blanc-Morzine in France, Italian ladies Masha Mularo and Paola Valmassoi in the Rally Nova-Gorica in Slovenia, and Belgians Luc Capasse and Herman Renaud in the Rally Niedersachsen in Germany, which join the class wins claimed the weekend before Italians Andrea Maselli and Camilla Gallese in Austria in the Rally Weiz and by Beat and Janine Wyssen in Switzerland, in the Rally del Ticino. Young French driver Ciamin turned in an excellent drive on the Rallye Mont Blanc-Morzine, which counts towards the French Rally Championship. Driving a Abarth 124 Rally prepared by Team Milano Racing, he dominated a bumper GT+ category that saw nine crews take the start, posting excellent stage times within the overall rankings of the special test stages, in a very tough, hard-fought rally that saw no fewer than twenty eight four-wheel-drive “R5” category cars taking part. It’s a success that keeps the French driver at the top of the GT+ classification of the French Rally Championship. "I'm delighted with my performance," Ciamin said at the finish. "And although this was my first time in this race, thanks to the Abarth 124 Rally's excellent setup I once again managed to make it into the top positions in the overall rankings." At the same time, the Rally Nova-Gorica in Slovenia saw the first R-GT success for the 124 Rally in the hands of a ladies' team as Mularo and Valmassoi won the GT category ahead of the Slovenian pairing of Matjaž Zupan?i? and Damijan Andrejka. Both crews were driving Abarth cars prepared by the Bernini Rally outfit. Mularo, who already has a successful career in the Trofeo Fiat Cinquecento in the 1990s behind her, was delighted with the result: "I was driving this car for the first time and I was surprised by what a good feeling I had at the wheel right from the word go. As the kilometres went by, I gradually realised just how much potential the car had, and I tried to make the most of it to finish first." Finally last weekend, the Rally Niedersachsen in Germany saw a Milano Racing 124 Rally driven by a Belgian crew, Luc Capasse and Herman Renaud, scoring class victory number third for the Abarth “spider” in this season.